On Friday 16th May 2014 we provided the wedding cars for Helen & Kris. We first met Helen at the National Motorcycle Museum wedding fayre on a cold and wet Sunday in January, 5 months later Helen & Kris’ day arrived and it was the warmest of the year, so far! The day started at Helen’s Parent’s house; our Regent Landaulet In Black & Ivory carried Helen’s Mother along with Helen’s 2 Bridesmaids and our Regent Landaulet In Black & Ivory With Wired Wheels carried Helen and her Father. The journey to Olton Friary Roman Catholic Church in Solihull took 10 minutes and we were in good time for the 1pm start, Helen walked down the aisle at pretty much 1pm on the dot, as she wanted to! The service lasted around 45 minutes after which Helen & Kris along with their guests had photos within the church grounds in the glorious sunshine. At around 2:30pm we left Solihull and headed for Nuthurst Grange, which is a country house hotel situated in Hockley Heath, Warwickshire. It was a pleasure to be able drive the 8 or so miles with the roof down, and it was something Helen & Kris really enjoyed. Upon arrival guests were greeted with drinks and canapés on the patio area which over looks beautiful countryside. At that stage our part in their day was over and we headed home, it was a joy to be involved and we wish Helen & Kris all the best for many happy years together. 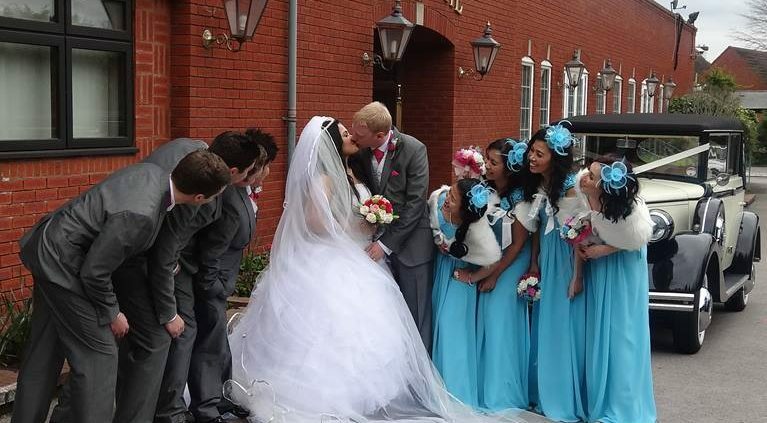 On Saturday 19th April 2014 we provided the wedding cars for Rhiannon & Andrew. They initially enquired via Rhiannon’s Mother who came across our website; www.loveweddingcars.co.uk, Andrew then came to our unit and choose our 2 Regent Landaulets In Black & Ivory. The day started with both cars arriving at Rhiannon’s Mother’s house, we were asked to arrive at 12:55pm, as usual we were 10 minutes early, expecting the “normal” slightly delayed departure! However, we were surprised when the Bridal party was ready for departure right on time! Our Regent Landaulet In Black & Ivory With Wired Wheels carried Rhainnon & her Mother and our Regent Landaulet In Black & Ivory carried Rhiannon’s 4 Bridesmaid’s. The journey to Church was made through Sutton Coldfield then Wishaw before arriving in Curdworth just after 1:20pm. Rhiannon was very keen to arrive a little early (the service was due to start at 1:30pm) so she could compose herself, have a few photos and of course check her hair & make up, before walking down the aisle. Following the 50 minute service Rhiannon & Andrew had photos within the beautiful grounds of the Church. We departed just before 3:00pm, the journey down to Snitterfield near Stratford upon Avon was an absolute breeze and the 35 miles took us just over 30 minutes. Upon arrival at Ingon Manor Hotel, Golf & Country Club Rhiannon, Andrew and their guests were greeted with a Pimm’s reception. It was an absolute pleasure to play a small part in Rhiannons & Andrew’s wedding day, we thank them for choosing Love Wedding Cars and wish them many happy years together. On Friday 4th April 2014 we provided the wedding car for Liza & Andy. They first contacted us via our website www.loveweddingcars.co.uk, they then came to our unit and viewed our cars where they chose our Regent Landaulet In Black & Ivory. Their wedding day was a dry, still and mild day, perfect wedding weather! We undertook 3 journeys to church, firstly taking the Groomsmen, then the Bridesmaids and finally Liza and her Mother. The service at Our Lady & St Brigids Roman Catholic Church in Northfield started at 1:30pm and lasted in the region of an hour, following the service they then had the majority of their photos taken inside the church. At around 3:30pm we set off for The Best Western Westley Hotel in Acocks Green. Before going into the hotel they had lots of photos with the car alongside their Groomsmen and Bridesmaids. Liza & Andy’s wedding day was a joy to be involved in and we wish them all the very best for the years to come as a married couple.